Well, hello, we meet again. The long running Jurassic Park/Jurassic World franchise is back with another movie in 2018. And that means something pretty important. We're going to need a T-Rex! Your child can be a mighty Jurassic predator, and rule Halloween as an all-time favorite. Have them practice their roar, and suit 'em up in this detailed costume. We can't say exactly what kind of adventure they're going to have as a T-Rex, but we're guessing it's going to be mighty ferocious and fun. Just like in the movies! 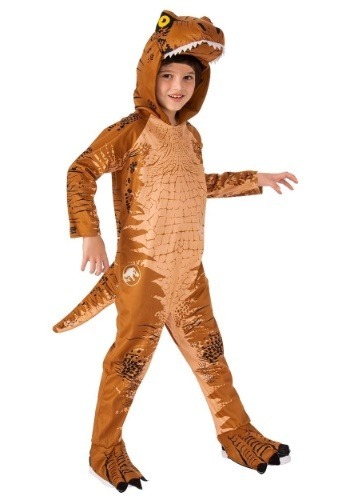 This Child Jurassic World 2 T-Rex Costume is officially licensed from the latest movie. Styled as a hooded jumpsuit, and it's fully printed with dino detail complete with a Jurassic World logo on the side. A plush tail is attached in the back and it's stuffed with fiberfill. Boot covers are attached, and they fit over his or her shoes with an elastic band under the foot. Just have them flip up the plush hood to complete the costume effect. The soft-sculpted dinosaur face sits on top of the head and with big eyes, teeth, and a snout, it will have them ready to give a mighty roar! Movies are, like, seriously our jam. And we've been all about Jurassic Park/Jurassic World seemingly forever. So, if you're a movie fan like us, stock up on dinosaur costumes this year, or if it's another movie you have in mind, shop for those, too. We've got tons of top selections from movies new and old, and everything to make sure your costume fun is the best it can be! My child just fell in love with this costume! In fact he still wears it around the house lol. It was delivered in perfect time and it kept him warm for the school parade.